On a proud day for Coltishall and Horstead, more than 250 people, young and old, gathered on Remembrance Sunday, 11th November 2018, to witness the lighting of a special Memorial Beacon at Lower Common, Coltishall. This was part of a global tribute known as ‘Battle’s Over’ honouring all those involved in the First World War and marks 100 years since the end of the largest war in our history. At individual locations around the world, and at the break of dawn, over 2500 pipers signified the ending of the War and the start of the day’s commemorations by playing the traditional Scottish lament ‘Battle’s O’er’. It has been suggested that this tribute alone will be marked in history as one of the most moving occasions of all time. One local villager said of the parade “It is so lovely to see so many people, young and old, coming together to remember all the people we lost in the war”. More locally, traditional memorial services took place in the morning at Horstead and the afternoon in Coltishall. 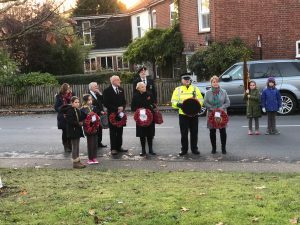 The incredibly poignant Remembrance Service at St John the Baptist Church included several readings from local parishioners as well as from 1st Coltishall Brownies, who decorated the church gates with poppies and led the parade to Coltishall Village War Memorial. Here, the community united to remember the 90 local men who gave their lives (see listing on P29 Nov issue). One local villager, said of the parade “it is so lovely to see so many people, young and old, coming together to remember all the people we lost in the war”. 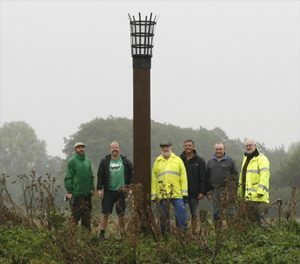 Later that day, once darkness had fallen, Horstead and Stanninghall Parish Councillor, Alan Browne, had the great honour of sailing across the River Bure to light the WW1 Memorial Beacon. He said “the journey to the lighting of the Beacon has been amazing from both Parish Councils support and the local businesses providing the materials and making of the Beacon, the landowners giving their full backing and the six men from Horstead and Coltishall marching the Beacon the quarter of a mile across the marsh and erecting it. This is a very proud achievement for all involved”. The Beacon was one of over 1300 other Memorial Beacons simultaneously lit across the UK to symbolise an end to the darkness of war and a return to the light of peace. Thanks also goes to the seven children from Coltishall Primary School for the special reading of ’Tribute to the Millions’. Local residents were also entertained by North Walsham and Aylsham Salvation Army Bands and local group ‘Fine City Sextet’ at the Rising Sun Public House that kindly hosted the event. This event was funded by the generosity of members of the local community. 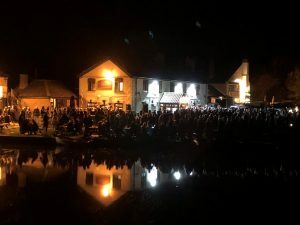 Beacon Co-ordinator, Bob Jennings, would like to offer his most grateful thanks to everyone who supported him over the last year to make this momentous and proud moment for the area such a great success. Photos were kindly provided by Frank and Jean Tipper. Earlier in the day, 15 Parishioners, including Coltishall Tree Wardens Peter Croot, Mike Spinks, as well as Commons Trustee, Bill Musson, planted a magnificent Scarlet Oak Tree at Ling Common to symbolise the poppies we all wear in remembrance. For more information on Battle’s Over, please visit www.brunopeek.co.uk and also see Marlpit Facebook page for more pictures from the day.